Description: This 20 pieces cardboard puzzle is made from 230gsm wood free paper and 950gsm double sided grey board. 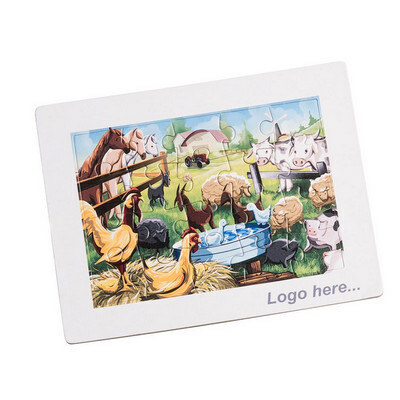 It is perfect for school or restaurants and is supplied blank so users can draw their own designs or print their logo to create their own unique puzzle. Features: Packaging: Polybag. Colour: White Material: (Cardboard) 230gsm wood free paper and 950gms double sided grey board Product Size: 228mm(w) x 176mm(h) x 3mm(d) Freight details : 100 per carton, 12.5kgs, 38 x 24 x 27cms; Decoration Type(s): Full Colour Print Decoration Area: Full Colour: Full coverage. Price includes : Undecorated. Setup is included.